Has anyone seen or tasted this before? If you have, you are as lucky as I am to have tried this rare seasonal delicacy. 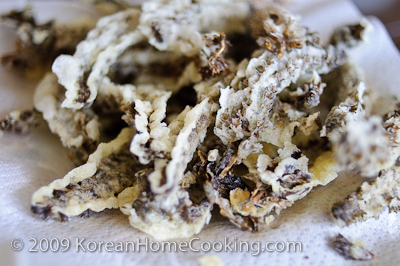 Perilla flower tempura is full of sesame-savory smell, and its crunchy bites simply melt in the mouth. I have had perilla tempura the first time when I was about eight or nine years old. This is when we lived in Korea in a house with a garden which blooms with perilla flowers every spring. Ever since we moved out of the house to an apartment, I never got to taste it. Though I craved, it was nowhere to be found. It was a pleasant surprise when my mom served this to us when we were visiting this spring. Literally, it was my second time trying it after almost 20 years. The taste was just as I remembered as a child twenty years ago, and I again fell in love with its smell and crunchy taste. I hope I get to try it again before I turn forty.